The emails are people, not just an address. Make sure your email list contains people who will be interested in what you have to say. Add a simple signup form to your website, request a few basic details, not just the email address. Use Facebook and customise the page to fit your product or event. Work with your existing busines contacts to build collective audiences, collaborate with pubs, suppliers, etc. 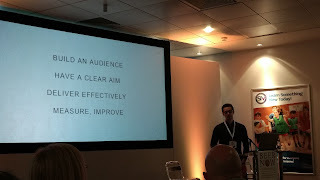 Visual, bitesize content driving at clear aims. SIBA sends a focused newsletter several times of year. Measuring is key here to see what is clicked and what's not, follow the numbers, let them guide the content. Move content around until it starts to follow the click patterns. Perform A/B testing using alternative subject lines, try content in different places, try rewording various phrases to see which ones hit the audience. Measure the response rate when you send emails at different times of day.